Home » Famous Paris destinations » Where Do You Go in Paris When It’s Hot? Berthillon! It’s super hot here in SoCal this week — hotter even than the worst days of last summer. 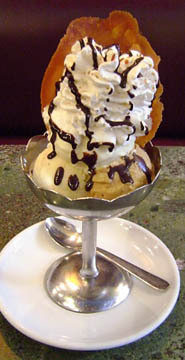 And that has me thinking of my favorite place in Paris to cool off – the famed Berthillon ice cream emporium. Consistently dubbed the best ice cream in Paris, Berthillon’s wonderful shop and next-door tea room sells both ice cream and sorbet in such unusual flavors as: (ice creams) coffee with whiskey, caramel nougat, salted-butter caramel (to die for! ), Grand Marnier, lavender, chestnut, gingerbread, honey nougat, and Earl Grey tea; (sorbets) apricot, violet, black currant, passion fruit, lychee, rose, rhubarb, and lemon-thyme. The products here are all natural – no chemicals, artificial sweeteners or stabilizers – and are shipped to restaurants throughout the region. But the real treat is visiting the shop on the Ile Saint Louis. The ice creamery offers up to 30 flavors per day, and can be had in cones, cups or – if you visit the tea room next door – delectable sundaes! One word of warning — expect long, long lines, especially on very hot days. 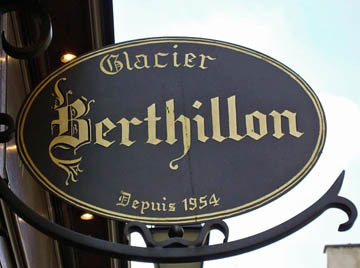 Parisians and tourists alike flock to Berthillon for a delicious, refreshing way to beat the heat! There are usually lines even in cold weather because the ice cream is just that good. This entry was posted in Famous Paris destinations, Food, Ile Saint Louis and tagged Berthillon, food, Ile Saint Louis by Bob Adams. Bookmark the permalink.